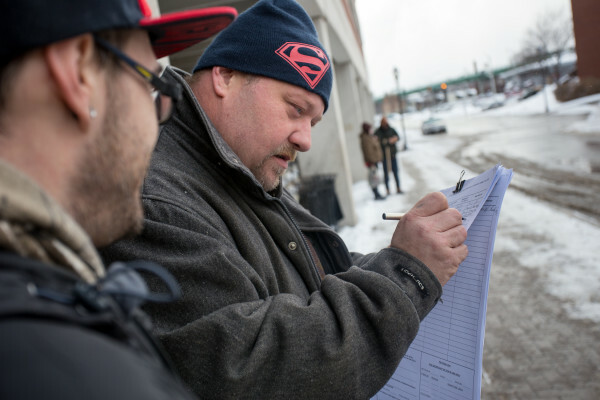 David McKenzie, 40, of Bangor signs a petition outside the garage at Pickering Square in Bangor in January for a referendum question to allow a casino in York County. AUGUSTA, Maine — A frantic, controversial effort to get Maine voters to hand a York County casino to a Las Vegas developer won’t be on the 2016 ballot after the secretary of state’s office invalidated most of its signatures on Wednesday. Secretary of State Matthew Dunlap’s office said in a news release that it validated less than 36,000 — or just 39 percent — of the more than 91,000 signatures that petitioners submitted to get the measure on the ballot. It needed just over 61,000 to go before voters in November. It’s a massive — though not unexpected — failure for casino backers, who organized under an opaque group and began collecting signatures in December ahead of a tight January deadline. That made for a hasty, bizarre campaign: Gatherers reportedly made as much as $10 per signature, but many were criticized for misleading tactics and some gatherers complained that they weren’t being paid on time. Horseracing Jobs Fairness, the ballot question committee that formed to support the casino, spent $156,000 through December’s end and was bankrolled by the sister of controversial developer Shawn Scott, who would be the only person who could get the casino license under the proposal. The campaign assuredly spent far more than that on the drive, but it’s unknown, since the campaign finance report that covers January isn’t yet due to the state. But $117,000 of that December haul was paid to Olympic Consulting, a Lewiston group run by former Republican legislator Stavros Mendros that manages signature drives. Mendros didn’t return a call seeking comment on Wednesday, and neither did Augusta lobbyist Cheryl Timberlake, the ballot question committee’s treasurer. But Wednesday’s rebuff wasn’t unexpected: Municipal clerks reported high rates of invalid signatures for the casino campaign. Casino backers now have 10 days to challenge the secretary of state’s decision in court, said Dunlap spokeswoman Kristen Muszynski. Of the invalid signatures, his office said nearly 36,000 were invalid because the circulator’s signature on the circulator’s oath did not match the signature on file, while another 16,000 signatures were invalid because they weren’t certified to be from registered voters. Thousands of others were invalidated for other issues.